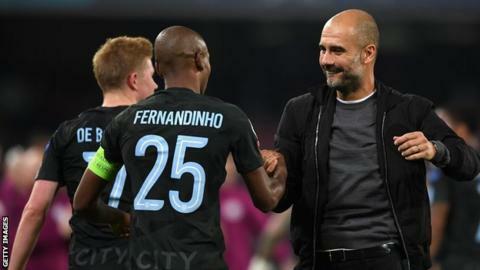 Pep Guardiola says his record-breaking Manchester City team is so good he would not have been able to get into it during his successful playing career. The Premier League leaders are the first English top flight side to win 15 consecutive league games. As a Barcelona midfielder Guardiola won six league titles, the European Cup and Uefa Cup Winners' Cup in the 1990s. But asked if he would make the current City side, he said: "No way. Fernandinho is much, much better." Guardiola, who won a third consecutive Premier League manager of the month award on Friday, is preparing his team to host fourth-placed Tottenham on Saturday (17:30 GMT). But he doubts whether City, who have an 11-point lead at the top of the table, can emulate Arsene Wenger's 'Invincibles' Arsenal side, which went the entire 2003-04 Premier League season unbeaten. He said: "It is not going to happen. We are going to lose games, it belongs to Arsene Wenger. "Now what happens is an exception, it's not normal what we've done. We'll try to maintain it but we are going to lose games." City have 49 points so far this season, dropping just two points in a draw against Everton in August. "Always we must make them feel they can be better players," said Guardiola. "We have to talk about bad things when we win, still we can do better. Guardiola, who hopes to have captain Vincent Kompany available again for City's Carabao Cup quarter-final against Leicester City on Tuesday, said he wants to sign a central defender in January. The Citizens are without long-term injured pair John Stones and Benjamin Mendy and Guardiola said central defence reinforcements are a priority. "We have just three centre-backs fit," he said. "Maybe we need a guy in that position. It's complicated, we are taking a guy for the next years and have to be sure he's the right guy to help us." You talk about a dynasty. City have got one of the youngest squads in the Premier League. Raheem Sterling, Leroy Sane and Gabriel Jesus have potential to be world class and be City players for the next 10 years. Kevin de Bruyne is also very young. Everything is in their favour to be one of the most successful teams in the Premier League.